Spring is coming; a time when change is looked forward to and expected. A time when newness and growth are celebrated. As such, I have exciting news to share with you. In 2011, Advice Interactive Group created Local Site Submit, a directory listing management platform to meet the needs of our agency clients and enable them to take control, of their online data. As our clients’ needs have grown and the industry has changed, our proprietary technology and our services have evolved to keep up with industry demands. To acknowledge these changes and our internal growth, we are proud to announce the rebranding of Local Site Submit, an Advice Interactive Group company, to Advice Local, beginning March 7. The days of operating with local presence management (LPM) and digital presence management (DPM) as separate entities are behind us. The convergence of these two, Local Digital Presence Management (LDPM), has tremendous value and is a cornerstone of Advice Local. With our solution, DPM and LPM work seamlessly together to enhance and continue to positively affect and cultivate a brand’s presence in search engines, and are vital to a business’s success. Generated approximately 1.1 million baseline reports. Submitted more than 4.1 million directory submissions. Monitored more than 6.8 million reviews across multiple sites. Monitored more than 27.5 million citations. Although the product name is changing from Local Site Submit to Advice Local, rest assured we will continue to deliver products and services that exceed your expectations time after time, delivery after delivery. Our Real-time Network, which immediately submits business listings to directories through our network of data partners. The Advice Local Marketplace, an industry-leading, exclusive marketplace, accessible through the dashboard, providing the products you need to implement your local search strategy. A resource center, where you can download eBooks and whitepapers, and watch training videos. Expanded services such as GPS mapping and local landing pages for multi-location brands. Our local digital presence management solution, available at AdviceLocal.com, is just waiting for you to take it for a test drive. Take the time to stop by and run a free Online Visibility Report or schedule a demo to see how Advice Local can help bring your local digital marketing goals to fruition. 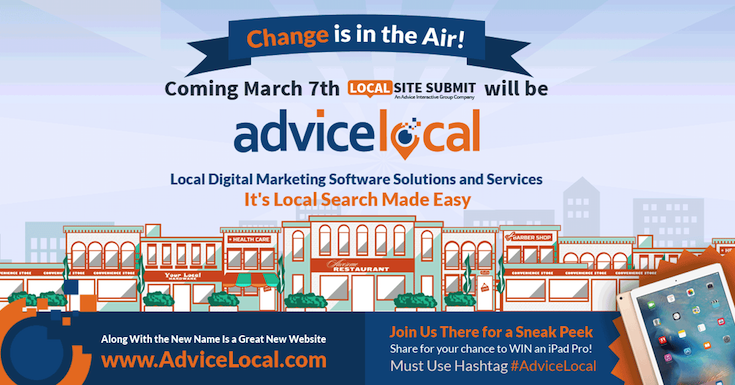 Exciting news … @LocalSiteSubmit is changing to #AdviceLocal! Get the story! With all this, and even more to come (Stay tuned! ), spring is sure to see your brands and businesses flourish like never before.